York Risk Services Group today announced that Maria Conry has been appointed Chief Marketing Officer. 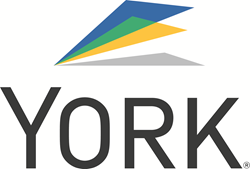 Ms. Conry will be responsible for York’s overall marketing strategy including branding, digital marketing, advertising, sponsorships and marketing communications. York Risk Services Group (York), a premier provider of insurance solutions including managed care, claims management, and alternative risk solutions, today announced that Maria Conry has been appointed Chief Marketing Officer. Ms. Conry will be responsible for York’s overall marketing strategy including branding, digital marketing, advertising, sponsorships and marketing communications. "York’s mission is to help people and organizations get back to health, work and productivity,” said Thomas W. Warsop, III, Executive Chairman of York. “That is a powerful mission and a great story to share. Maria will help us tell that story and communicate the value we bring to our clients, claimants, and society in innovative and impactful ways.” Best of all, she has been a part of the York family for 8 years, and I am very pleased that we are able to leverage our in-house talent,” he added. Maria has nearly 20 years of experience partnering with mid-market and FORTUNE 500 companies. Most recently, she served as Managing Director of CWT Interactive, an innovative strategic marketing consulting organization serving a diverse group of clients. The CWT team provided strategic marketing, branding and digital marketing solutions to create meaningful customer experiences. Prior to joining CWT, Ms. Conry held executive and marketing positions with a global branding and design agency, FITCH and Resource/Ammirati, now IBM iX. "I'm excited to take on this new role at York. We have significant expertise to support our mission and a strong opportunity to drive greater customer engagement. I’m passionate about creatively telling our story, sharing our expertise, and elevating our brand to help accelerate growth,” commented Conry. Ms. Conry holds a BS degree in Business Administration with a specialization in Marketing from The Ohio State University Fisher College of Business. York Risk Services Group Inc. is a premier provider of diversified insurance and risk management solutions, including claims management, managed care, specialized loss adjusting, pool administration, and loss control nationwide. York provides risk management and managed care solutions to a variety of strategic partners, including insurance carriers, self-insureds, brokers, wholesalers, MGAs, programs, risk pools and public entities. As one of the largest TPAs in the U.S., York delivers customized claims solutions for all lines of business, including property, liability, products liability, ocean and inland marine, environmental, transportation and logistics, construction and workers’ compensation. Based in Parsippany, New Jersey, York has over 80 offices in the US and a strong international presence. Visit us on the web at http://www.yorkrsg.com.